Early in the morning, from Marrakech , we start our journey to cross the High Atlas Mountains (Tizi-n-Tichka at 2260mt high). 30 Km before reaching Ouarzazate the gate of the desert we stop for a visit to the prominent Kasbah of Ait-Ben Haddou, a UNESCO World Heritage site. After lunch in Ouarzazate, we will take you through the famous Draa Valley. On the way, we visit Tamgroute, the old Koranic library and the village of green pottery and ceramic made by the locals. 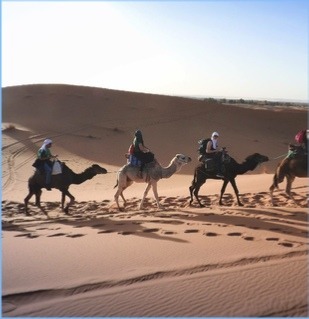 Arrival in Zagora, take camels to admire the sunset and spend the night in the nomadic tents under the stars. 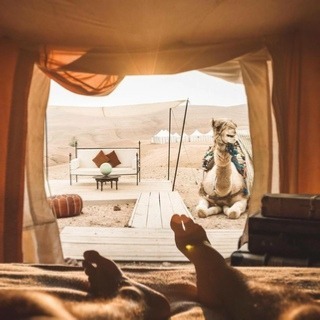 Wake up early to see the sunrise over the dunes, after a typical breakfast in the bivouac of Zagora, you ride back the camels to catch up the 4×4, then drive back to Marrakech via Ouarzazate.